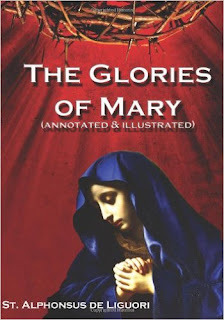 Complete, Unabridged, Restored: +Brand new illustrations from Sequential Artist Jacob Rice +Study questions +Biography of St. Alphonsus Liguori +A Treatise on Catholic Theology and the Bible The Glories of Mary is a classic of Mariology, written during the 18th century by Saint Alphonsus Liguori, the great Doctor of the Church. The book was written at a time when Jansenists criticized Marian devotions, and was written in part as a defense of Marian devotion. 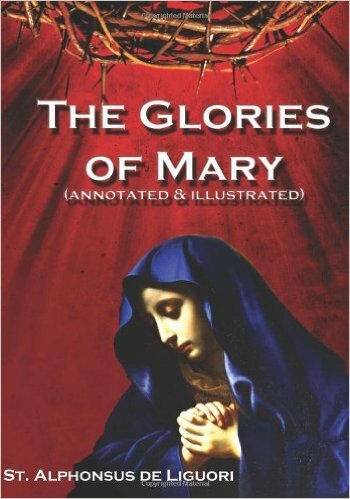 The book combines numerous citations in favor of devotion to the Blessed Virgin Mary from the Church Fathers and the Doctors of the Church with Saint Alphonsus' own personal views on Marian veneration and includes a number of Marian prayers and practices. Part 1 focuses on the Salve Regina and explains how God gave Mary to mankind as the "Gate of Heaven". St. Alphonsus quotes Saint Bonaventure: "No one can enter Heaven unless by Mary, as though through a door." Part 2 deals with the key Marian feasts such as the Immaculate Conception, Nativity, Purification, Annunciation, Assumption, etc. Part 3 looks at the Seven Sorrows of Mary, explaining how her "prolonged martyrdom" was greater than that of all other martyrs. In part 4 fourth we discuss ten different virtues of the Blessed Virgin, while part 5 rounds out the work with a collection of prayers, meditations and devotions.